Crowley Maritime Corp. announced today that it is combining its Defense Freight Transportation Services (DFTS) contract management group with its other government services under its Crowley Solutions business unit. The change will allow transportation management services under the $2.3 billion federal contract to be leveraged along with the company’s other government capabilities and offerings to create greater value through economies of scale and management efficiency. Under the new structure, Shiju Zacharia has been promoted to vice president, government supply chain, and will continue to lead the DFTS efforts in addition to the federal Universal Service Contract (USC) management and expeditionary logistics efforts. Chris Goss, director, expeditionary logistics; Wally Gonzalez, director, strategic accounts; Dave Touzinsky, director, customer accounts; Patrick Wallace, director, strategic sourcing and operations; and Smijith Kunhiraman, manager, government technology, will report to Zacharia. “Automation and procurement are key to scaling our operations. 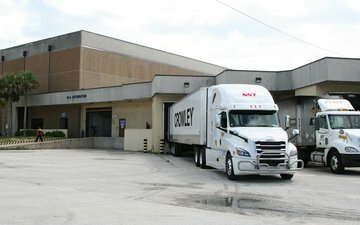 Crowley continues to design and refine the government supply chain network, leveraging data analytics and 3Gtms continuous pool optimization to reduce DoD transportation costs,” said Zacharia. Crowley utilizes the 3Gtms technology platform to provide industry-leading transportation management services that synchronize load planning and optimization through rate management, integration, execution and payment, while providing additional levels of transparency to the customer through measurement and reporting. These same transportation management capabilities and dedicated vendor network are also being deployed within Crowley Logistics to benefit commercial customers with efficient, scalable services that are bringing increased velocity to their supply chains and reductions in their landed costs. As part of the DFTS program, Crowley has successfully rolled out 38 locations and has achieved 37 percent small business participation, exceeding federal contract requirements, while meeting on-time and response performance needs handling more than 1,500 moves daily. Under the DFTS contract, Crowley moves various types of cargo from thousands of material suppliers through 29 Defense Logistics Association (DLA) sites and nine Defense Contract Management Association (DCMA) sites around the continental U.S. The program encompasses all forms of transportation, including less-than-truckload (LTL); full truckload (FTL); expedited; time-definite and refrigerated services; rail; specialized equipment, and customs clearance service for freight of all kinds (FAK). Delivery locations include vendor facilities, U.S. Department of Defense (DoD) distribution centers, and U.S. military installations. USC is a global ocean transportation contract for the U.S. Transportation Command (TRANSCOM). The expeditionary logistics group supports execution of domestic and international contracts for the U.S. government. Crowley’s solutions group also provides government ship management services, including management of Military Sealift Command and U.S. Maritime Administration (MARAD) vessels; project engineering and naval architecture services, and specialty marine towing services.